Minimally Invasive Aortic Valve Replacement and Surgery has become again a hot topic following Barbara Walters’ surgery to treat her aortic valve stenosis. Ms. Walters’ problem is a very common and frequently mistreated heart valve disease in our elderly population. A strong and WRONG bias against operating on elderly patients often denies life-saving procedures on otherwise functional and sharp minded senior citizens. Well, Ms. Walters is an octogenarian and we all like to see her healthy for as long as we can. Would anybody in his right mind simply look at her age to deny her an operation that will allow a much longer and better life? Aortic valve stenosis is a deadly disease that requires immediate attention. This page will teach you to recognize it and will give you an update on the best minimally invasive aortic valve replacement surgery options to treat it. These two malfunctions can also coexist in the same patient. 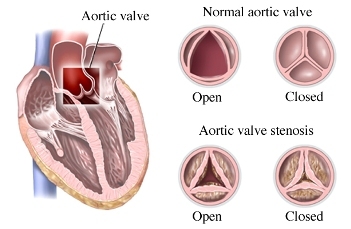 Aortic Stenosis (AS) means that the aortic valve is too narrow. It forces the heart to work very hard to push an adequate amount of fresh oxygenated blood against the resistance offered by a tight, barely opening valve. Mechanically speaking, the heart with aortic stenosis has to develop a much higher internal pressure to guarantee the same pumping action and output of a normal heart. Initially, our heart can get by and adapt to the work overload. The cardiac muscle thickens to increase its strength (pretty much like the muscles of a bodybuilder that lifts increasingly heavier weights), but it eventually tires out and creates a life-threatening condition. In addition to that, a thick muscle in the heart is not a good thing. A thick and enlarged heart is much stiffer than a normal heart and this stiffness impairs the heart’s ability to fully relax in between heartbeats. Keep in mind that the heart has to reload with oxygenated blood during its relaxing cycle (diastole) and if it does not relax well its pumping function can be severely compromised by a condition known as diastolic dysfunction. These pictures above show you the difference in the opening between a normal valve and a severely calcified stenotic aortic valve. That narrow opening will make the heart struggle to push blood flow through it. Do not hesitate to consult your physician for regular check-ups or if you feel that there are changes in your energy level or health condition. Aortic Stenosis is often associated with a heart murmur that your doctor or a heart specialist could easily detect by listening to your chest with the stethoscope. That murmur is the hissing sound of the blood squirting across a critically narrowed valve. A simple physical exam and an echocardiogram can confirm the diagnosis and give an accurate estimate of its degree of severity. Severe AS does not arise overnight. It starts as a mild stenosis and then progresses to moderate and then severe. It is important to know what to look for in the echocardiogram reports that are generated at regular intervals to decide when it is time to consider surgery. Echocardiographic findings in the moderate to severe range should always prompt a detailed discussion about therapeutic options and proper timing of a surgical intervention with your treating physician. That would be a good time to see a heart surgeon in consultation and reassess whether or not cardiac symptoms related to this condition are currently affecting our patient. Aortic Jet Velocity. As the valve gets progressively narrower the blood flow through it will get faster and generate those “squirting” noises that doctors commonly describe as heart murmurs. A flow velocity of more than 4 m/s (meters per second) is in the severe range, 3 to 4 m/s is in the moderate range. Let me give you a familiar example from our everyday life experience. What happens when you place your thumb at the open end of a gardening hose while watering your plants? The water will squirt through faster and further because of the blockage you created with your thumb. That is no different from the real flow physics of a narrow valve. Aortic insufficiency (AI) means that the aortic valve “leaks” when it is closed. In this case, a considerable percentage of the fresh oxygenated blood that is supposed to flow out of the heart ends up flowing backward. Again, the heart is forced to work harder to guarantee an adequate forward flow. Most patients with aortic valve insufficiency can live without symptoms and with the help of medical therapy for a variable length of time. When the heart starts wearing out and losing its power output, patients will experience symptoms of congestive heart failure. Ideally, patients should undergo a minimally invasive aortic valve replacement before their heart starts weakening. Anyone with a known diagnosis of Aortic Valve Insufficiency needs to be followed up very carefully by his doctor and cardiologist to ensure that the surgical therapy is offered before it is too late. There are different causes of AI. In some cases, it is necessary to replace the valve. Otherwise, a simple repair and tailoring of the native aortic valve is performed. Straight talk on Aortic Valve Stenosis and Surgery. Frank calcific aortic valve stenosis is quite frequent in our population. It becomes more prevalent with advancing age: 1-3% in patients aged 65-75 years, 2-4% in those aged 75-85 years, 4% in patients older than 85 years. It is, without a question, a disease of the elderly with the exception of patients with bicuspid aortic valves who present with severe AS or AI two decades earlier and the rare case of rheumatic valve disease. Most of them are diagnosed because of their symptoms of Syncope (dizziness, fainting), Angina (chest pain) and Congestive Heart Failure (shortness of breath, leg swelling, weakness) or because of an obvious and loud systolic murmur. The current guidelines of the American College of Cardiology are very clear about treatment options on these patients. Severe symptomatic aortic valve stenosis is a lethal condition that needs effective mechanical relief in the form of aortic valve replacement. There is NO other medical treatment for this disease. Without aortic valve surgery three-quarters of these patients will die within three years of symptom onset, as you can see in the following graph. The next graph shows very eloquently the striking difference in survival between medical and surgical treatment. Further, it is important not to waste time once a diagnosis of Aortic Valve Stenosis is made. Several reports in our literature have been published of sudden death within three months of onset of symptoms. Graph from: Schwartz F., Baumann P., Manthey J., et al. The effect of aortic valve replacement on survival. In spite of this very well-established statistical data, severe aortic valve stenosis continues to be a grossly “neglected child” in our medical community. A good example is the all-too-common case of the little old lady who complains of worsening shortness of breath and ankle swelling. Her doctor prescribes some Lasix (a diuretic) and she gets better. Two months later she shows up in the emergency room with recurrent CHF that resolves with a few intravenous shots of Lasix. An Echocardiogram is obtained at this time and it shows severe or moderate-to-severe AS (Aortic Valve Area of 1.1 cm2 or less). This elderly patient and her family are reassured that some more Lasix will do the trick and that, after all, they might not want to rock the boat with a “dangerous” aortic valve replacement. Few more months go by and the family will call her doctor to inform him that Grandma has passed away. There is a widespread and WRONG perception that aortic valve surgery would not be a good option in an elderly and otherwise functional patient. If we go back to the mortality rates I discussed, medical therapy is, by far, the most dangerous choice. The life expectancy of patients with Aortic Valve Stenosis who undergo an aortic valve replacement is the same as any patient of the same age that has never be affected by aortic valve disease. Severe symptomatic Aortic Valve Stenosis, I might add, does kill you much faster than early colon CA. Let’s now consider our surgical options. A well-meaning relative will ask: “Isn’t Grandma too old and frail to withstand open heart surgery?” My answer is: “No. Grandma is too old and frail to withstand severe aortic valve stenosis. Let me show the statistics on this condition!! !” The way I perform a minimally invasive aortic valve replacement in my service has dramatically changed the impact of this operation on the overall patient’s experience and on the speed of recovery. Most patients will be able to return to their families two or three days after surgery. A few pictures will illustrate this technique better than a thousand words. The surgical incision is about 2” in length and is carried out through the space in-between the third and the fourth rib on the right side of the chest. There is no breastbone cutting involved with this approach and this is a great advantage for wound healing in patients with advanced osteoporosis (brittle bones). Further, infection of these tiny surgical wounds and/or any significant bleeding are exceedingly rare. The entire minimally invasive aortic valve operation and all the necessary connections to the heart-lung machine are carried out through the same tiny incision. This is an important distinguishing feature when compared to other techniques described in the surgical literature that employ additional cannulations wounds to access the groin and/or neck vessels. 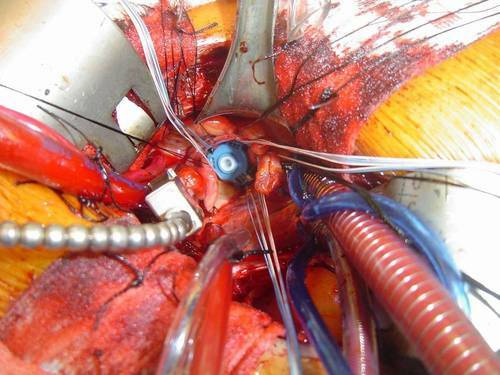 As you can appreciate from the following picture, the new valve can be securely exposed and tied to the heart, right at the center of my operative field. The following operative picture shows you what a calcified aortic valve specimen looks like once it has been removed from the heart. Please note the heavy beads of calcification that characterize a stenotic aortic valve. These calcific formations and their propensity to break off and travel to the brain are a primary concern when we discuss transcatheter interventions and high stroke rates related to these nonsurgical techniques. That is the reason why a surgical AVR continues to be the best option for the overwhelming majority of patients with surgical aortic valve disease. The minimally invasive surgical approach allows patients to have their valve replaced in the least invasive way and with the smallest risk of stroke because the surgeon can remove all the calcifications under direct vision. 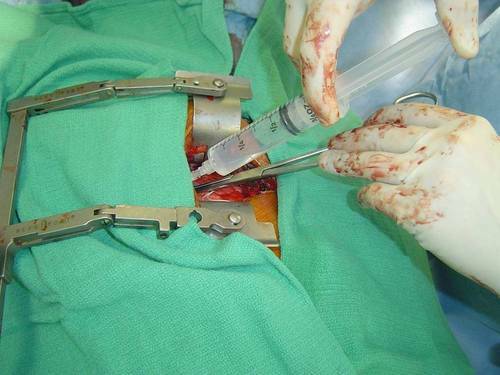 I routinely use the same minithoracotomy incision for ASD (Atrial Septal Defect) repairs, Mitral and Tricuspid Valve repairs, excision of atrial myxoma, perimembranous VSD (Ventricular Septal Defect) repairs, septal myectomies in IHSS patients, MAZE procedures for Atrial Fibrillation. In female patients many of these operations can be performed through an incision hidden in the skin fold underneath the right breast with excellent cosmetic results. Once the minimally invasive aortic valve replacement is completed and prior to the wound closure, I inject a long-lasting local anesthetic (marcaine 0.25%) in the spaces between the ribs above and below my mini-incision. Most minithoracotomy patients will be completely pain-free for at least 10-14 hours and have a quick and smooth recovery with minimal discomfort. 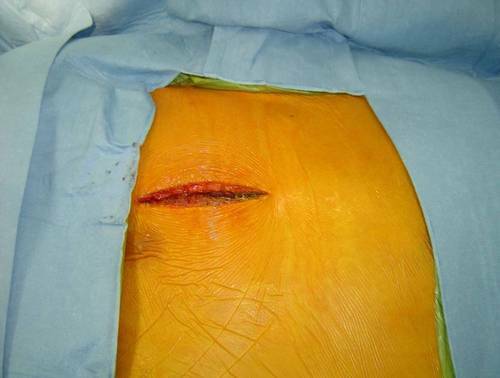 All wounds are closed with subcuticular stitching technique. This plastic surgery technique places melt-away sutures underneath the skin and results in a barely noticeable scar, without any stitch marks. The day after minimally invasive aortic valve surgery all surgical drains are removed and most patients are encouraged to walk and start some physical therapy. The vast majority of our patients are ready to go home in two or three days with specific arrangements for a visiting nurse and physical therapy service. Even the elderly patients well in their 80’s and, occasionally, 90’s enjoy a much faster resumption of a normal lifestyle. They return to my office in two weeks for a follow-up visit and by that time they are instructed to resume their normal level of activity and their visits to their family doctor. I hope this page and its contents will help more colleagues, patients, and concerned families achieve a real contemporary perception of what can be done for Aortic Valve Stenosis patients of all ages. I would be delighted to answer your questions and receive your comments and suggestions. Feel free to call me directly at the office if you want to discuss any specific condition or clinical scenario. This low-impact, patient-centered approach to minimally invasive aortic valve replacement affords excellent outcomes and restores a normal life expectancy and improved quality of life in the vast majority of treated patients. I strongly encourage you to present this information and start a discussion about the best heart surgery options available for this and other conditions.